One of the best parts of being a blogger are the opportunities and people you get to meet and in this case a delicious meal at a chic restaurant with the ocean as a backdrop. Two weeks ago I was invited to visit the new Pure Ocean Restaurant in St. Lawrence Gap and as a lover of food I gladly accepted! 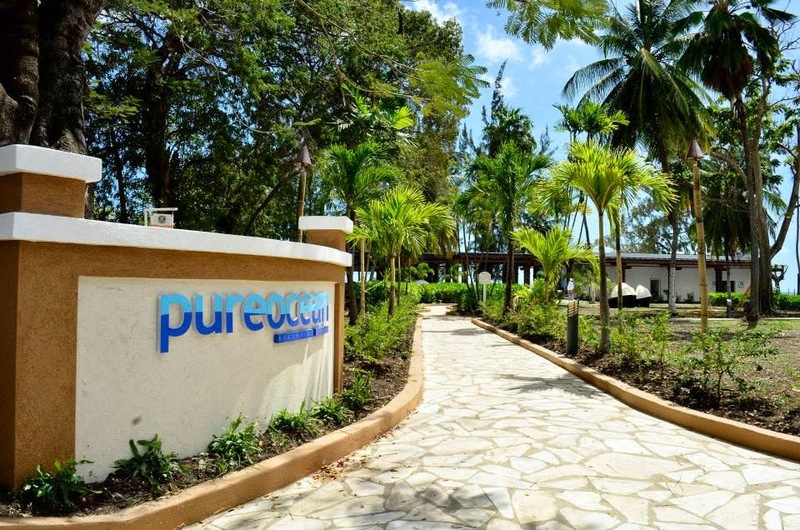 Pure Ocean is part of the Divi Resorts brand and while it serves as one of the resorts restaurants it is also open to the general public. I sat down with General Manager of the hotel; Alvin Jemmot and Wanda Maynard from marketing and over lunch I learnt a bit more about the Divi brand as well as the new restaurant. Divi is definitely a family resort with activities and amenities such as mini golf, tennis, four swimming pools and a play park. The all suite hotel offers local rates ideal for a "staycations". The restaurant, Pure Ocean is a 94 seated eatery located in St. Lawrence Gap directly on the beach and while the concept of dining beach side is not something new to Barbados, the ability to sit at a well set table and be served directly on the beach while in swimwear and sarong is certainly a luxury to many. The design of the restaurant is what initially caught my eye. Made with Guyanese greenheart wood the restaurant is open plan and in my opinion a modern take on a distinctly Caribbean style. The restaurant is especially beautiful on an evening with the flambé lined walk way, beautiful blue accent lighting and reflection of the moon on the water. With award winning executive chef, Henderson Butcher at the helm, Pure Ocean is destined for success. The menu is an exciting array of dishes which he describes as Bajan cuisine with international flair. The menu includes Bajan classics such as cou cou and salt fish as well as unique creations such as the sugar cane shrimp and pork cutlets in a Mount Gay barbecue sauce. golden apple chutney and perhaps most unexpected - mauby ice cream. I tried the mauby ice cream for dessert and was pleasantly surprised. The combination was fresh with a nice kick afterwards that beckoned me to taste more. As I spoke to executive chef, Henderson Butcher I gained a greater appreciation for the food and understood his and Mr. Jemmot’s distinct vision for the restaurant. Mr. Butcher studied French cuisine and brings that international level of quality to his dishes. For a starter I had the Fritto Misto, the crispy calamari was accompanied by a fresh and refreshing tomato salsa. As a main course I had the special of the day which was freshly caught tuna complimented by local produce. Another interesting fact that impressed me is that the restaurant uses primarily local produce and supports local farmers and shops at farmers markets as much as possible. They even grow some produce on the Divi property and have a fantastic herb garden. They also use whatever items are in season on the property such as breadfruits and mango’s for seasonal dishes. I wasn’t sure what to expect initially but from the moment I arrived until I left I was treated to fantastic service from smiling staff. The overall experience was a lovely one and it was the perfect way to end my week. Please note all photos are the property of LDB unless stated otherwise. Big fan of this place. Great date spot. Makes me psyched to be a foodie and head upstate. Awesome staff at Boston restaurants as well. Such amazing and really fresh food. The only downside is that it fills up quickly.